The Kendu Zero Spill waterbowl is a safe permanent method to eliminate spills from splashing. The flexible waterer ensures a dry environment with less labour. For over 20 years I watched my dairy cows splash water out of their waterbowls all over their feed and bedding. It was my daily chore to then clean up the wet mess. For years I looked for a better waterbowl that cows could not splash water out of. In frustration, I tried to make a waterbowl that would stop my cows from splashing water. In January of 2006 I assembled a contraption that was deep like a pail with a tube valve to supply water. This crude invention absolutely eliminated the water spilled from the waterbowl. I watched for several hours as my cows drank from the new device without being able to spill a drop. It only took a few hours to assemble this device which solved a problem that had bothered me for decades. I assumed that there must be something similar available somewhere in the world to purchase but I was wrong. I decided to fabricate something for my own use. Within weeks of using the new spill proof waterbowls I saw the benefits for other farmers. I sent out invitations to surrounding farmers to come to my farm to see this new device and I was surprised by the large response. I decided to refine the design into an affordable product for use in a variety of applications. Many farmers asked to try prototypes of the waterbowls in their barns. I sent many out to a variety of farms and asked for feedback on its performance. The waterbowl worked so well at stopping spills that I began calling it a Zero Spill waterbowl. I also surveyed farmers for their opinions on how to improve the waterbowl. I questioned many farmers about what problems they have had with their conventional waterbowls. I even set up a booth at a farm show with an early prototype and asked for feedback. I received comments from farmers on problems that had arisen with various types of waterbowls over years of use. In addition to my own experience with waterbowls I realized that there was a great deal to think about when designing a new waterbowl. I would try to learn from the problems of past designs to produce the most trouble free waterbowl available. This waterbowl would be designed by farmers for farmers. A high flow tube valve is located inside a deep flexible bucket. The cow activates the tube valve by pushing it with their muzzle in any direction. 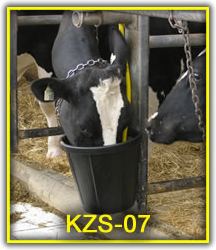 The water enters the bucket as quickly as the cow can drink but the level of the water stays low in the bucket. Any splashes are contained in the bucket to keep the area around the KZS dry. The valve is held by a stainless steel mounting bracket and the flexible pail is supported and protected by a galvanized back frame to keep it upright against a post or against a wall. A poly plate supports the pail and minimizes stress on the pail when it is pushed or abused. A simple common sense solution: Don’t stop the Splashing, Just stop the Spilling. Click to enlarge The Kendu Zero Spill waterbowl does not try to stop the splashing. Splashing is only a problem if the water makes it out of the bowl. 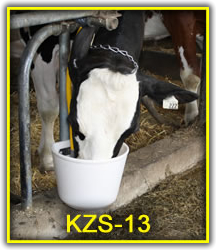 The KZS simply stops the splashes from leaving the waterbowl. An animal splashes because they are bored and the only toy they have to play with is their waterbowl. Changing an animal’s natural behavior is difficult if not impossible. Some methods currently used involve spring coils or inward bent rims. These are ineffective and make drinking uncomfortable. Animals are still able to fill the water level up to the rim and lap it out or dunk their muzzles in to overflow it. The Kendu Zero Spill is radically different than the conventional shallow rigid waterbowl. Water is contained in an extremely deep bucket made from a flexible rubber compound. A high flow tube valve is located inside the deep bucket. The animal activates the valve by pushing it in any direction. The water level is maintained at about 2 inches in the bottom of the bucket. An animal cannot raise the water level above this unless they submerge their nostrils to access the valve. The distance from the water surface to the rim of the bucket is at least 10 inches. 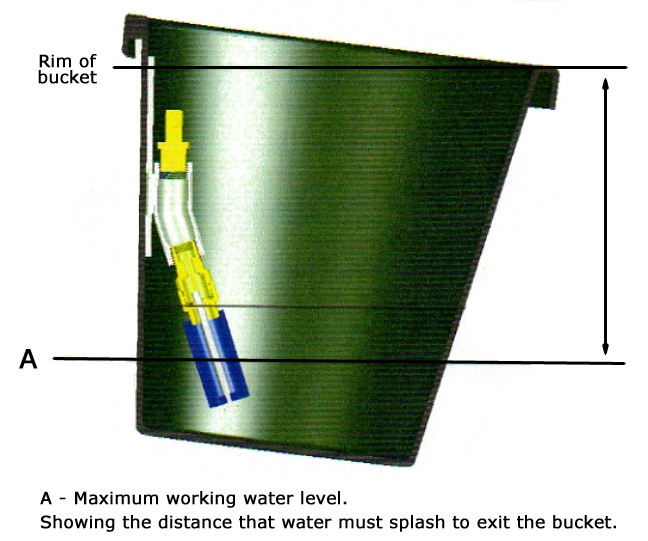 The water volume is similar to standard waterbowls, however the remaining volume of the bucket is intended only to keep splashes contained. When an animal splashes, there is no chance of the water escaping straight up over 10 inches to spill out.